I’m going to just lay it out there – I did not expect to like this book. Why not? Because I’m biased. I think Jack Sparrow has become the lazy man’s jolly roger – a way to ride Disney’s coat tails to try and siphon off a little of their merchandising power. So combine this book’s Jack Sparrow lookalike on the cover with the fact that lexicons of nautical terms already exist (very few of which make for an interesting read) and you can see why I assumed it might be garbage. And so it was to my happy surprise that How to Speak Pirate: A Treasure Chest of Seafaring Slang turned out to be not merely decent, but actually quite brilliant in its own right. The secret? As is so often the case it’s the ever elusive thing I like to call “good writing.” You’d be amazed at the difference it can make. Geordie Telfer offers us multiple chapters on how to speak pirate in different situations – work, romantic, dining, etc. Notice that these are lessons in how to “speak pirate,” and not “how to speak like an authentic 18th Century sea maurauder from Sussex.” To the contrary, this book rejoices in its use of Hollywood slang, fictional pirate talk, and even things simply made up by the author that do indeed “sound piratey” to the modern ear. This is the first step in making this a fun and interesting read. The second step is the humor. Rather than trusting the odd subject matter to be entertainment in and of itself, Telfer offers a healthy dose of wit throughout. But what’s more, he’s also well aware that speaking pirate is a generally a geeky thing to do, and makes good use of this fact to good-natured comedic effect. The third step in making How to Speak Pirate such a worthy read is truly the genius stroke – Telfer not only preaches the subject, but he practices. 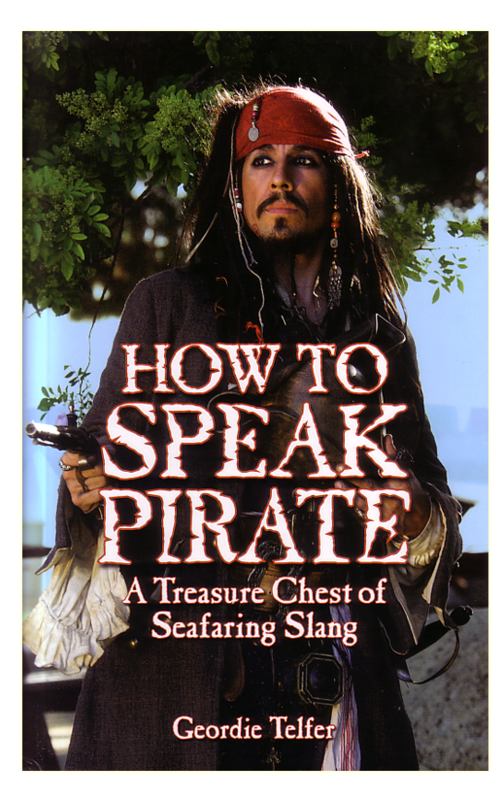 In the practical lessons, pirate speak is used selectively as part of the common dialogue, and in the lexicon segment many definitions themselves involve pirate speak. This makes for an entry level “full emmersion” experience. I’m told that full emmersion is the best way to learn a foreign language, and it would seem equally so when speaking pirate. While there are multiple books on talking like a pirate available, for me only one has truly and properly tackled the subject, that being The Pirate Primer by George Choundas (ironically, The Pirate Guys’ books, being founders of Talk Like a Pirate Day, don’t make the cut as they focus far more on living like a pirate than simply talking like one.) But where Choundas’ work is a scholarly wonder, Telfer’s is an entertaining one. But despite their differences in approach to this worthy subject, both deserve to be placed side-by-side each other on the shelf of anyone who truly wishes to learn to talk the talk. Note: I’ve decided to close comments from this review. Aside from “How to Speak Pirate”, Geordie Telfer, has also written a book called “Real Canadian Pirates.” It appears that there is some amount of controversy regarding his conclusions in that previous book, and readers have seen fit to begin debating these issues in the comments of this review. The only problem is, this isn’t a review of “Real Canadian Pirates”, and I consider it unfair to Mr. Telfer to expect him to defend a work entirely unrelated to the subject at hand. Additionally, I don’t believe that any questions regarding Mr. Telfer’s competence as a historical scholar have any bearing on a review of “How to Speak Pirate”, which is far more based on humor and pop-culture. This entry was posted in Books and tagged geordie telfer, talk like a pirate by Bilgemunky. Bookmark the permalink. Sounds absolutely smashing- are there any links where one could read an excerpt? Thanks, mate, but I prefer The Pirate Primer- it’s at once light and fun, and substantial with an official, book-smart feel to it. Still, I suppose this sounds nice, too (‘sides which, you already reviewed the other one). It’s a great read, and I dare anyone to read it without actually doing the pirate voice (at least in your head). Made me laugh out loud many times. I also highly recommend Mr Telfer’s excellent ‘Real Canadian Pirates – Buccaneers and Rouges of the North’. Telfer knows about as much about pirates as Paris Hilton knows about brick-laying. While the slang book may be funny, I warn everyone to stay away from “Real Canadian Pirates”. Entertaining, maybe, but all lies. The fact that he lists Simeon Perkins as a pirate is ridiculous; Simeon Perkins was a poor merchant who did not leave the small town he lived in for years at a time. He abhored violence. The Liverpool Packet, which he lists as a pirate, was a privately owned warship in the service of the British Crown during the War of 1812. Telfer twists and fabricates to make pirates. It is the equivalent of calling a pharmacist a drug-dealer and describing them like a thug. Mr. Verge – have you actually read my book “Real Canadian Pirates”? It is not, in fact, “all lies” but was carefully researched from the sources listed in the back of the book. Furthermore, I clearly (and extensively) explain the differences between pirates and privateers and my criteria for including both in the volume. Simeon Perkins was a merchant, but he was by no means poor; this is clear from the primary source I consulted for this chapter, namely the voluminous diary written by Perkins himself. Please check your own facts more clearly before impugning my work. An additional clarification regarding Simeon Perkins. I see from my first response to Matthew Verger’s wildly inaccurate comment of Dec 6 that it may still be unclear why Simeon Perkins is included in “Real Canadian Pirates”. While he was not a pirate (and nowhere in the book do I state that he was), he was a key backer of several privateer ships in the 18th century. Also Mr. Verge’s characterization of Perkins as a “poor merchant who did not leave the small town he lived in for years at at time” is painfully ignorant. Simeon Perkins emigrated to Canada from the US when he was in his late 20s and furthermore, became an important and prosperous public figure, holding 27 different government positions during his lifetime and representing Queens County in the Nova Scotia House of Representatives, a feat difficult if one does not leave one’s town for years at a time. Regarding the Liverpool Packet, Mr. Verge is correct in stating that it was a privateer ship during the War of 1912, but it is difficult to see why he feels the need to state this since the chapter on this vessel in “Real Canadian Pirates” makes this abundantly clear. Again, Mr. Verge, in future, please save yourself some embarrassment by checking the facts before claiming to present them. In point of fact, Mr. Telfer’s book is one of the most well researched books on Pyrates available – and the fact it covers the history of Pyrates, Privateers and such in Canada (or depending on dates, the territory that would be Canada) is not only admirable, but a valuable piece of missing Pyratical history! Having some experience with “Real Canadian Pyrates” (in the family, so to speak) we applaud his book – and the fact that it is comfortable to read; not some dry, scholarly tome as books of this historical bent often are, but written in plain conversational tone. Suitable for Pyrate or landlubber alike. Actually Mr. Telfer, if you were to go to the Simeon Perkins House the interpreters there could tell you that Colonel Perkins died in a considerable amount of debt. He was by no means rich. He held many, many government positions, but they did not pay. He had a lot of bad business ventures and many things stolen and raided during the revolution. Ten years after he passed away his house had to be sold to pay his debts. He wasn’t famous for being rich, he was a great community leader and Liverpuddlians recognized that, they came to him for help constantly. And it was possible to be a Member of the Legislature without leaving town for some time. The legislature didn’t pay you at the time so many people refused to leave their towns (and businesses) until the government started paying people to go to meetings. It’s about a two day sail so it would have been common for Mr. Perkins to stay in his area for quite a long time, sometimes not venturing to Halifax for years. I have read your section on Simeon Perkins and I believe you have interpreted him to be some sort of investor, taking all the cash while the hard working sailors go out and struggle for him. Many people in Liverpool wanted to go privateering and not just for the money. Liverpool was attacked repeatedly during the revolution and the planters there finally decided to stand up for themselves after not receiving any naval support from Halifax. People wanted to protect their town. Privateering at that time wasn’t just about the money, it was about protecting ones property and family. There are so many aspects of privateering and although some (like the packet) were great money making ventures, Simeon seemed more concerned for the safety of his growing family and town. He became Colonel of the militia and helped thwart several attacks to the town and used his privateering vessels to guard the harbour which was mainly unprotected before that.